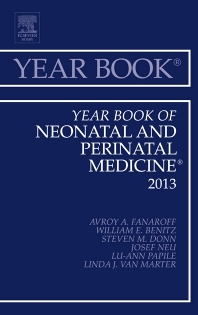 The Year Book of Neonatal and Perinatal Medicine brings you abstracts of the articles that reported the year's breakthrough developments in neonatal and perinatal medicine, carefully selected from more than 500 journals worldwide. Expert commentaries evaluate the clinical importance of each article and discuss its application to your practice. There's no faster or easier way to stay informed! Chapters in this annual cover the most current information on all aspects of neonatal and perinatal medicine from genetics to labor and delivery to issues related to many key bodily systems (heart, respiratory, nervous system, etc.) of newborns. Other topics for 2004 include neurology, gastroenterology and nutrition, medical disorders of pregnancy, fetal evaluation, and neonatal behavior.